“Across the country, parents who once conceded that their homework expertise petered out by high school trigonometry are now feeling helpless when confronted with first-grade work sheets. Stoked by viral postings online that ridicule math homework in which students are asked to critique a phantom child’s thinking or engage in numerous steps, along with mockery from comedians including Louis C. K. and Stephen Colbert, these parents are adding to an increasingly fierce political debate about whether the Common Core is another way in which Washington is taking over people’s lives. In Louisiana, the dispute intensified this month when Gov. Bobby Jindal said he wanted to withdraw the state from the Common Core, although others questioned his authority to do so. Already, the legislatures in Indiana, Oklahoma and South Carolina have repealed the Common Core standards, and for many candidates running for political office, their views on the standards have become crucial election issues. The new instructional approach in math seeks to help children understand and use it as a problem-solving tool instead of teaching them merely to repeat formulas over and over. They are also being asked to apply concepts to real-life situations and explain their reasoning. This is partly because employers are increasingly asking for workers who can think critically and partly because traditional ways of teaching math have yielded lackluster results. In global tests, American students lag behind children in several Asian countries and some European nations, and the proportion of students achieving advanced levels is low. Common Core slims down curriculums so that students can spend more time grasping specific mathematical concepts. But for parents, the transition has been hard. Moreover, textbooks and other materials have not yet caught up with the new standards, and educators unaccustomed to learning or teaching more conceptually are sometimes getting tongue-tied when explaining new methodologies. Even supporters of the Common Core say changes are being pushed too quickly. Rushing to institute a new math curriculum does not make sense if you are “planning to get the job done in a rational way,” said Phil Daro, one of three principal writers of the Common Core math standards. Tensions over the Common Core have been heightened because the standards are tied to new standardized tests being introduced in many states. Teachers are fretting that their performance ratings will increasingly depend on how their students perform on these tests. While several states have postponed the consequences of test results on teacher evaluations, many educators feel the pressure. In sum, the Common Core has a lot to offer but the rollout has been rushed in most states due to pressure from the U.S. Department of Education. The parents in our states and school districts who provide the vast majority of funds (along with other local taxpayers) for our public schools are right to criticize and to push back against the federal government’s overreach of its authority. New America Foundation Criticizes American Higher Education – Please! The New York Times has an op-ed piece written by a representative of the New America Foundation, a supposed non-partisan think tank in Washington D.C. Essentially the piece claims that all of the problems in American K-12 education are present in American higher education. The author, Kevin Carey, discounts the opinions of world education leaders that the United States generally ranks first in international opinion polls for its higher education system. Instead, he bases his claim on a standardized test administered by the Organization for Economic Collaboration and Development. This is the same rhetoric that appeared in a government report, A Nation at Risk in 1983, that blamed all of the United States economic woes on the K-12 public schools. Yet in in the 1990s and through much of this century, the United States enjoyed a period of immense economic growth and prosperity. However, A Nation at Risk, was a convenient ploy used to “reform” our K-12 schools into test-prep centers focusing solely on test scores as the criteria for success. These reforms have failed and the American people are mounting a backlash against this corporate view of education. So Mr. Carey, we say to you and the economists that you refer to, please stay out of education and higher education, and concentrate on reforming economists and corporate America. It is amazing that when America and the rest of the world had the Great Recession in 2008, not a single economist or corporate strategist had predicated its seriousness except possibly those in financial circles who had rigged the system for their own profit that caused the recession in the first place but they were not about to let the rest of the world in on their secret. World War I: One Hundred Years! Today is the 100th Anniversary of the assassination of Archduke Franz Ferdinand and his wife, Sophie, that set off World War I on June 28, 1914. The war to end all wars was devastating in terms of casualties and overall destruction. It demolished empires and destroyed kings, kaisers and sultans. It introduced chemical weapons and aerial bombing. The total number of casualties in World War I, both military and civilian, was about 37 million: 16 million deaths and 21 million wounded. The total number of deaths includes 9.7 million military personnel and about 6.8 million civilians. 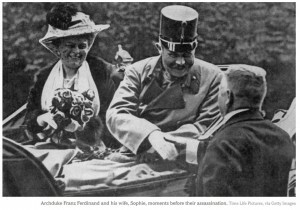 The New York Times has established a website that contains several excellent articles and images of The Great War. It is a grim reminder of the destruction and carnage that man can inflict on his fellow man. Under Carmen Farina: Sanity and Balanced Literacy Returning to New York City Schools! “The city’s Education Department turned away from balanced literacy several years ago amid concerns that it was unstructured and ineffective, particularly for low-income children. And Ms. Fariña is facing sharp resistance from some education experts, who argue that balanced literacy is incompatible with the biggest shift in education today: the Common Core academic standards. During her six months as chancellor, Ms. Fariña has reduced the role of standardized tests, increased collaboration among schools and shepherded through a new contract for teachers that includes more training and more communication with parents. But her push for a revival of balanced literacy may have some of the most far-reaching implications in the classroom. 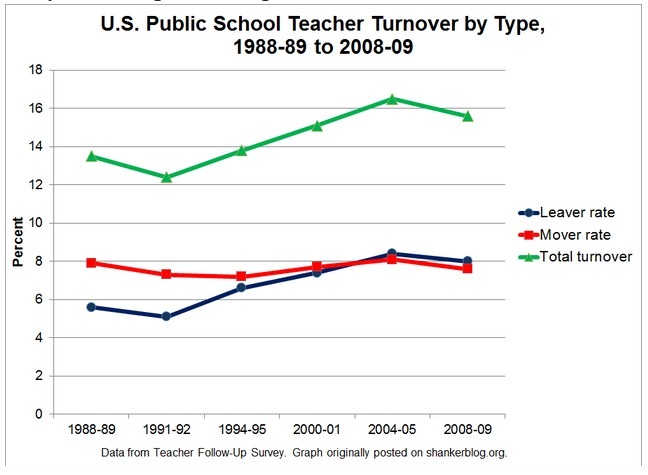 Teacher Attrition – Some Analysis! 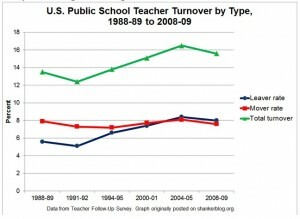 “One plausible explanation would be increasing retirements among baby boomer teachers. This seems to have made a difference, but, judging by the TFS breakdown by reasons for leaving, it does not come close to explaining the full increase. The entire posting provides additional analysis on the issue and provides a number of resources for readers wanting to delve further. Creationism Banned in Schools in the United Kingdom! “is rejected by most mainstream churches and religious traditions, including the major providers of state funded schools such as the [Anglican] [Catholic] Churches, as well as the scientific community. It does not accord with the scientific consensus or the very large body of established scientific evidence; nor does it accurately and consistently employ the scientific method, and as such it should not be presented to pupils at the Academy as a scientific theory. Thousands of schools in America that received public funding still teach creationism as an “alternative” to evolution, according to Slate. A recent Gallup poll showed that over 40% of Americans hold the creationist belief that God created humanity as it currently exists a mere 10,000 years ago. Survey: The Use of Instructional Games in K-12 Education! 45% of the surveyed teachers listed insufficient time as a barrier to bring games into the classroom while 44% cited cost. These are problems familiar to all of us in education, but it’s also interesting to see how other frequently cited barriers fall lower on the list, such as being unsure of how to integrate games into the classroom (only 23%) and a lack of administrative support (only 14%). In higher education, we face different challenges and opportunities, but there’s hope for wider adoption now that knowledge and availability barriers are diminishing. While the methodology (see below) is a little sketchy, the survey provides some insights into the emerging world of gaming in K-12 education. Arne Duncan: Most States Will Not Be in Compliance with Students with Disabilities Act! “After years of holding states accountable under the law for such things as timely evaluations of students and due process hearings, the Education Department plans to look at results. For the first time, the government will define compliance with the law not just in terms of what states do for students with disabilities, but with how those students perform. According to this new results-driven accountability framework, states will be responsible for students with disabilities’ participation in state tests, gaps in proficiency between students with disabilities and their peers, and performance on the National Assessment of Education Progress, or NAEP, the only national standardized test. This marks the first time the NAEP, which is often described as a low-stakes test, has been used for school accountability. The U.S. may deem states to be meeting requirements, needing assistance, needing intervention, or needing substantial intervention. Consequences range from extra help to financial penalties. If a state needs assistance two years in a row, the law mandates that the Education Department “take actions such as requiring the state to obtain technical assistance or identifying the state as a high-risk grant recipient,” according to a government press release. I wish I could say that Duncan’s new framework will improve special education services in our public schools but it won’t. It is just more of the testing and accountability mentality that has driven our national education policy for the past decade. Public school principals, teachers, parents, and students have pretty much had it with federal mandates for testing and accountability and have little confidence in anything that comes out of Washington, D.C. There is a growing grassroots campaign for localities to take back their schools from policymakers in Washington D.C. who are driven by politics and ideologies and not what is good for the education of children. Will Quantum Computing Be the Next Big Breakthrough? “…a group of physicists and computer scientists who are funded by Microsoft are trying to take the analogy of interwoven threads to what some believe will be the next great leap in computing, so-called quantum computing. If they are right, their research could lead to the design of computers that are far more powerful than today’s supercomputers and could solve problems in fields as diverse as chemistry, material science, artificial intelligence, and code-breaking. …In the approach that Microsoft is pursuing, which is described as “topological quantum computing,” precisely controlling the motions of pairs of subatomic particles as they wind around one another would manipulate entangled quantum bits. Although the process of braiding particles takes place at subatomic scales, it is evocative of the motions of a weaver overlapping threads to create a pattern. Several other major companies such as IBM and Lockheed-Martin have also been exploring the feasibility of quantum computing. It is quite possible in the next decade or so, we may see the fruits of this research. Todd Feltman: Letter to the New York Times Editor on the Common Core! Todd Feltman, a graduate of our PhD Program in Urban Education in 2013 had a letter (see below) published to the editor of the New York Times in today’s edition. His comments are right on! “Common Core, in 9-Year-Old Eyes” (front page, June 15) focused on a boy’s viewpoint. Teachers must actively listen to students to find out what is happening in their minds about school learning. It is unacceptable that Chrispin Alcindor at 9 feels like a failure and that his future depends on two state tests. His teacher, Trisha Matthew, sounds like a practical, dedicated and personable teacher who is doing her utmost to support student engagement and achievement. If the Common Core is here to stay, the material to meet the standards must be taught in incremental steps, acknowledging the learning styles of our students. Let this article be a reminder that teachers must continue to build on academic strengths and focus on vulnerabilities in a supportive and professional manner. Hope has arrived, since there is finally a dedicated chancellor who cares deeply about the academic and emotional well-being of the 1.1 million students in the New York City public school system. The writer is an elementary and middle school literacy achievement coach, New York City Department of Education.